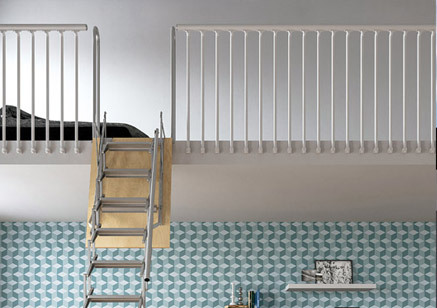 Electric and insulated scissor loft ladder, made from 11 white-painted, embossed sheet steel treads and protected by electroplating. 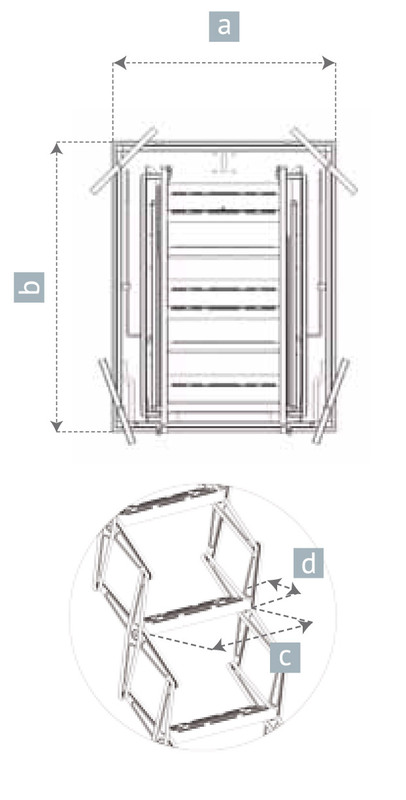 The mobile structure is joined by steel bolts, which allow smooth and accurate electro-mechanical movement. 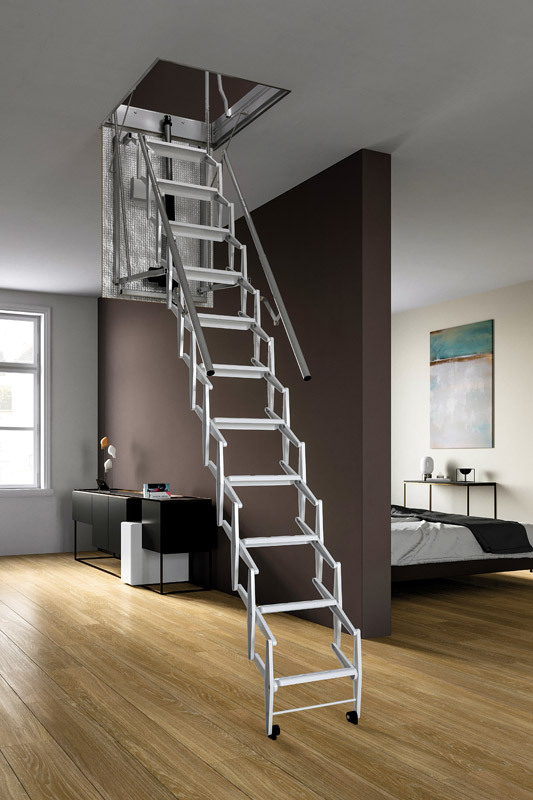 To help you ascend and descend, the loft ladder has a dual galvanized telescopic handrail and two exit handles are provided to enable an easy exit onto the upper floor. The hatch is made of a prime poplar plywood wood panel (15 mm) having minimum formaldehyde emissions (class E1, UNI EN 13986:2005 standard). 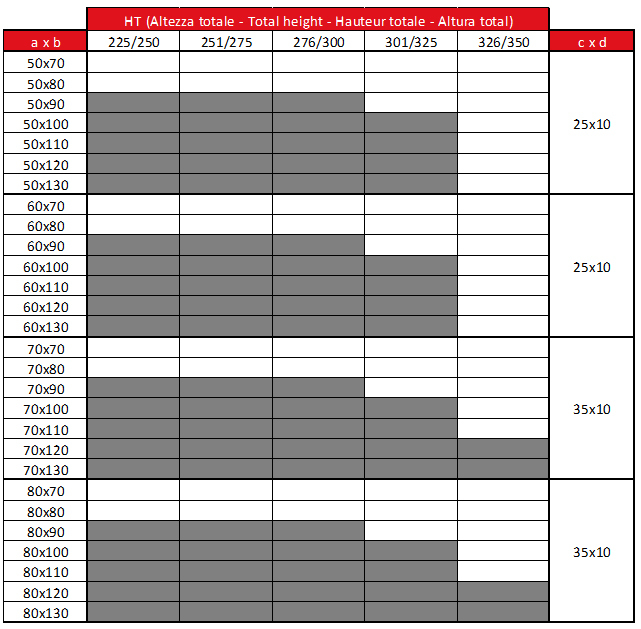 The electric and insulated scissor loft ladder is certified according to European Norms (UNI EN 14975:2007) and grant a load capacity of 150 kg (tested with static test load of 260 kg). 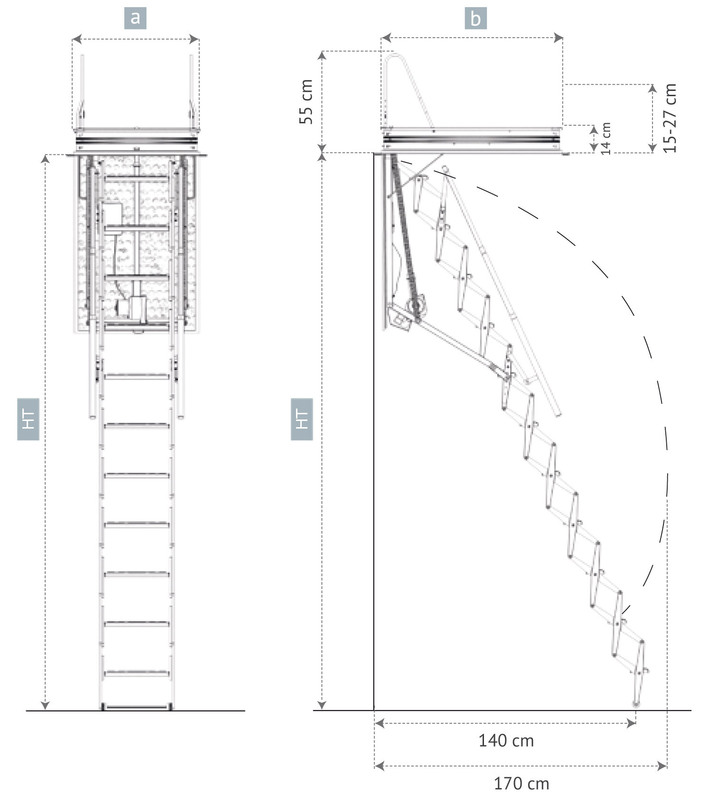 The electric and insulated scissor loft ladder is delivered fully assembled, ready to be installed. 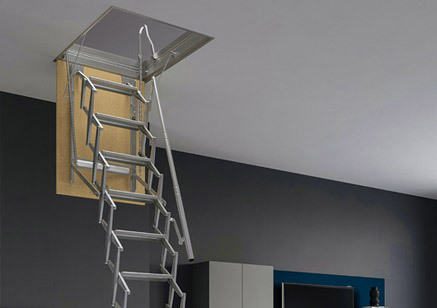 Thanks to the electric motor (220 Vac – 240W), the opening and closing of the loft ladder become easier, faster and safer. 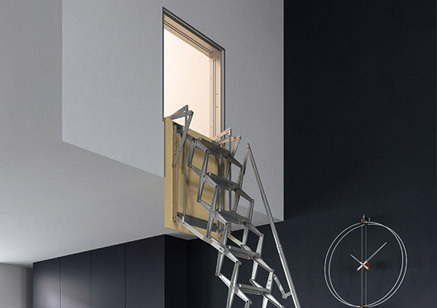 Moreover, the release screw for manual opening placed on the hatch panel gives the possibility to open the loft ladder even in the event of a power cut. The remote control supplied with the ladder opens and closes the ladder effortlessly in few seconds thanks to the gear motor and electronic control unit. Instead of the remote control, it is also possible to request for a special push button panel (“manual control” button). 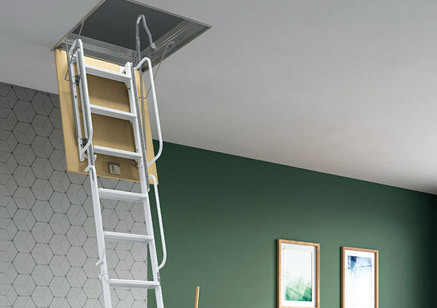 The electric and insulated scissor loft ladder is the only one having a dual-insulation system. 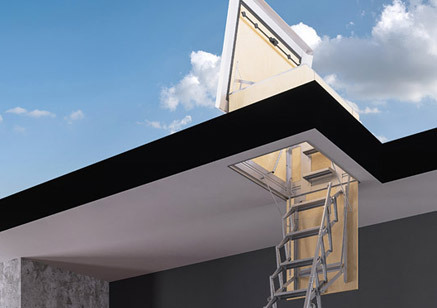 The first is represented by the trap door of the main frame, which is made of a prime plywood wooden panel having minimum formaldehyde emissions (class E1, UNI EN 13986:2005 standard) and covered with high-performance thermal insulating material to prevent recirculation of hot-cold air through the attic. The second thermal insulation system is guaranteed by the “Termocover” accessory, a sort of ‘cap’ designed and patented to further insulate the lower floor from the upper floor. Thanks to this dual-insulation system, it is possible to reach a certified total insulation value equivalent to U = 1.1 W/m2K, thus obtaining economic benefits as well as increased comfort and energy-savings.